Insignia to make its own strategic decisions. They question basic principles, boost the company’s innovation capability, and shape the industry’s future. In this occasional series, we introduce you to PhD candidates at Opel and shed light on their scientific research. There are currently 19 candidates working on their theses at Opel. Nine of them are attached to the Advanced Technology E/E Department led by Dr. Nikolas Wagner. Drivers learn incredible skills behind the wheel without even realizing it. Think about all the decisions you have to make to pass another vehicle on the freeway, for example. When should you pull out to pass? And once you move into the next lane, how long should you keep on accelerating to make sure you don’t cut off the driver behind you, yet not run into the car in front? Drivers make decisions like these as if they were second nature, without really thinking about what they are doing. And of course, driving is about more than just a series of actions. You are constantly reacting too. How hard do you need to brake if a car pulls in front of you in your lane? Drivers don’t consciously work it out, they ‘just know’ by instinct. But Jeremias Schucker and David Augustin, both of whom are working towards a PhD at Opel, know only too well how much effort is involved in calculating all of these procedures in advance, programming them and then coordinating braking, throttle, and steering inputs to make them happen. That’s because they have spent the last three years working hard to implement a highly automated driving (HAD) system in an Insignia. Modified: The test vehicle is equipped with specially developed displays that allow the students to plug in their laptops and view measurement data. Eyes on the road: The highly-automated vehicle detects the trajectories (or the lines through bends) chosen by other road users and accordingly adjusts its own line. 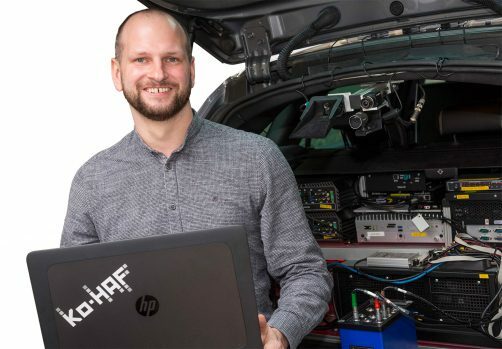 They are two of six PhD students working on the Ko-HAF (the German acronym for Cooperative Highly Automated Driving) project in the Advanced Technology E/E Department, which is headed by Dr. Nikolas Wagner. Both students will receive their doctorates from the Technische Universität Darmstadt. Jeremias Schucker is originally from Reutlingen in Bavaria, while David Augustin grew up in Lindlar near Cologne and had previously studied in Aachen. Both of them applied for the PhD scholarship over the Internet despite having no previous connection with Opel. “That’s really changed for the better in the last 36 months,” Jeremias Schucker assures us. The Ko-HAF project is divided into five parts, each referred to using the German acronym ‘AP.’ Schucker and Augustin are working on ‘AP 4,’ led by Dr. Stefan Berger. AP 4 is focused on developing the functionality that allows an autonomous vehicle to operate under both normal and emergency conditions. Augustin’s work is focused on environment mapping. 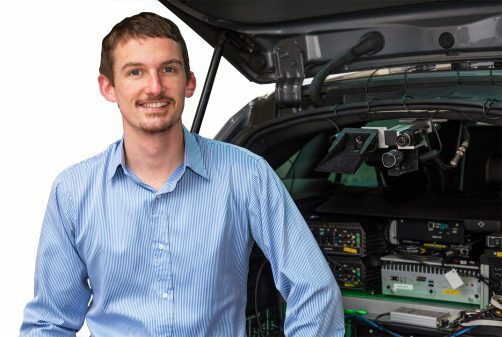 That means it is his job to make sure that the data collected by the various sensors and cameras in the car, which is constantly being compared with the map data from the navigation system, is collated and evaluated in a way that allows the vehicle to make its own ‘strategic’ decisions. Schucker, on the other hand, is responsible for translating these decisions into appropriate throttle, braking, and steering inputs. You might think that would mean spending countless hours in front of a computer, but that’s not quite the way the last three years have panned out: “We have definitely been allowed to get our hands dirty,” David Augustin reports. Real-world testing: The Insignia test vehicle on the road at the Opel Test Center. Both students have already had the opportunity to test the technology they have developed at the Opel Test Center in Dudenhofen. During testing they also had the chance to drive their Insignia themselves – or rather, to sit behind the wheel and watch the Insignia drive. Before they were allowed to do so, they still had to be certified as qualified to take over the controls in an emergency; that’s what the regulations say. And in any case, the car isn’t (yet) capable of driving without any human involvement. “The driver has to be able to regain control of the vehicle within ten seconds of a warning signal appearing,” Jeremias Schucker explains. “That’s the requirement for the highly automated driving systems that should be going into mass production in the near future.” And just in case something really isn’t working properly yet, the test Insignia is also equipped with an emergency stop button. Pressing it will shut off all the test systems immediately. The project also involved extensive field work. 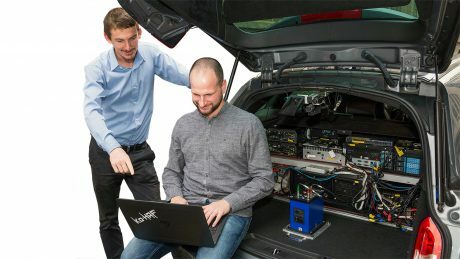 For example, the PhD students collected data from over 400 passing maneuvers on freeways around Frankfurt and used it to teach their vehicle how to plan ahead on the road. The Ko-HAF project has now been successfully completed. The event to mark the end of the project was held at Dudenhofen, with all Opel’s consortium partners invited to attend. The test Insignia drove around the test track by itself and completed a passing maneuver without incident. For the time being, Jeremias Schucker and David Augustin are chained to their computers as they look to complete their PhD theses over the next few weeks. Neither is yet sure what they will do afterwards. But one thing is for sure – they certainly have a connection to Opel now.